10 Reasons To Visit Pagudpud, Philippines - "The Boracay of the North"
Located in the Ilocos region of the Philippines, Pagudpud is the farthest geographical point from Manila (the capital city) without leaving the island of Luzon. It's a trip of about 350 miles, which takes about 10 hours driving. Or you can take a 1 hour flight into Laoag Airport, which is about a one and 1/2 drive away from Pagudpud. #1 - Clean and Green: Pagudpud is so clean and the greenery is amazing. It's like a hidden paradise that you will never forget. #2 - White Sand Beaches: Experience the beautiful scenery, amazing coastlines and the astonishing white sand beaches. Pagudpud is often referred to as the "Boracay of the North" because of its crystal blue water beaches. Tourists can go swimming, surf the waves and witness the unforgettable sunset. #3 - Must-See Landmarks: The Patapat Viaduct bridge that connects Ilocos Norte to Cagayan Valley is one of the most photographed places in Ilocos. It's built at the side of the Cordillera mountains, alongside the blue lagoon. There is also Kapurpurawan Rock Formation, an amazing formation of white rocks that was naturally formed over time because of the forces of water, current and waves. 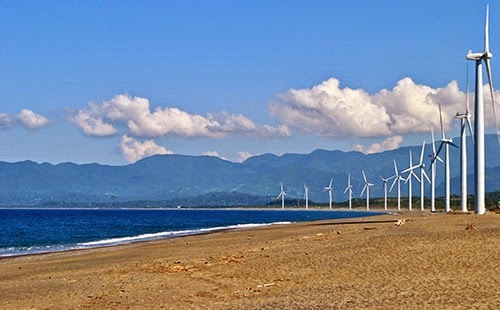 #4 - Giant Windmills: At the Ban­gui, Ilo­cos Norte fac­ing the Ban­gui Bay, there are 20 giant windmills that are so large, they can pro­vide 40% of the elec­tric­ity needs of North­ern Luzon. Seeing these giant windmills with the mountain backdrop is truely breath-taking. #5 - Very Safe: Pagudpud is known to be a safe destination. It is not dangerous at all, and the people here are very friendly and hospitable. #6 - Affordable Beach-Front Resorts: Located along the shores of Pagudpud, if you want to hide under the hot sun, you can rent a nipa hut for about $5 USD. But for those who want to relax in a beach front room, prices start at most resorts at just $35-40 USD per night. #7 - Inexpensive Food: Be sure to stop by the wet market for fresh and delicious seafood. Or have your food grilled right in front of you on the beach. #8 - Great Delicacies to Take Home: Be sure to try their famous bagnet (the native version of Lechon Kawali) that you’ll never forget, and their special empanada and biscocho. #9 - Hiking Like You've Never Seen: Just 10 minutes outside of Pagudpud, you can pay a 20 pesos (less than $1 USD) preservation fee and a tour guide will accompany you going to the falls. You will walk through beautiful forests and see all kinds of streams, wooden bridges, and rock formation. The hidden streams are so clean and refreshing, you can swim there. #10 - Tons of History: There are tons of historical landmarks including Marcos' Mansion and Museum, a private museum by the Marcos family displaying Marcos memorabilia; The famous streets of Vigan, with European architecture-style houses and cobblestone streets; and even Cape Bojeador Lighthouse (also known as Burgos Lighthouse) which will make you feel like you are in the Spanish colonial period in the Philippines.